I’ve been visiting New York City for several days and have carried my camera everywhere! My plan was to take pictures of every delicious meal I ate. Didn’t happen. I think I was so lost in the glory of the food that I forgot all about taking time for photographs. dang. However, yesterday morning I did not forget. 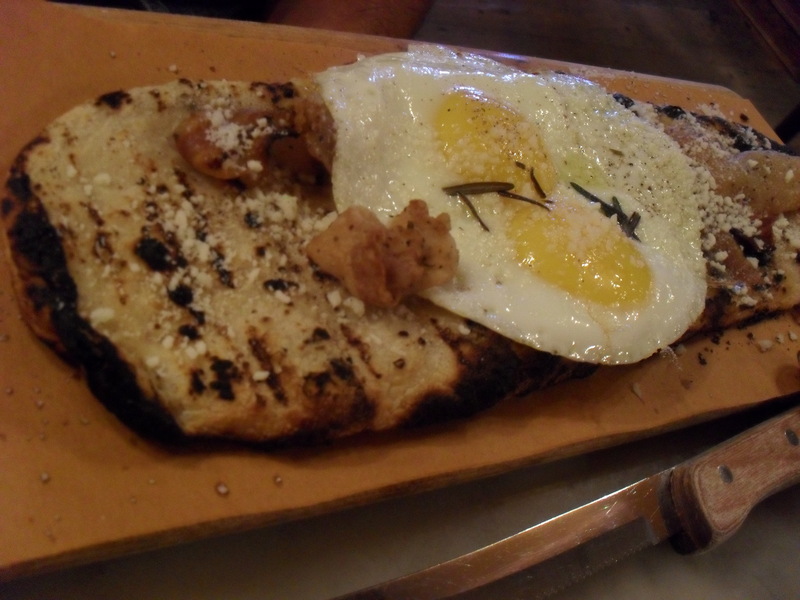 We walked to Morandi at Waverly Place for brunch. When we arrived all the tables outdoors were taken, so we were given a small table inside. The rustic interior of the little trattoria was simply delightful – very warm and inviting. Within just a few minutes the whole restaurant began to fill – we had arrived at just the right time! We ordered deliciously strong coffee and sweet pistachio bread. 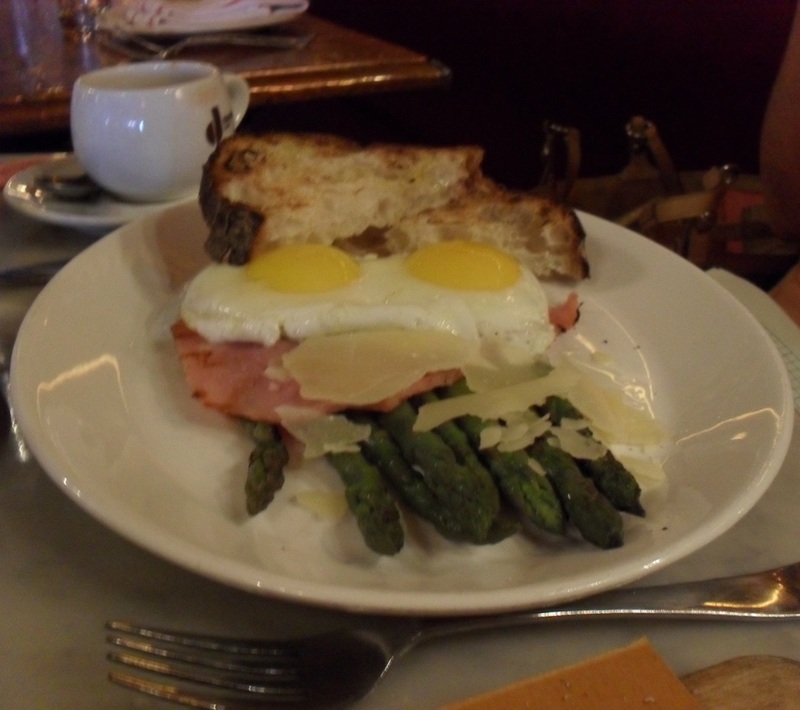 Pictures below show our Focaccia “occhio di bue” (sunny side egg, pancetta, and pecorino), and Asparagi Milanese con prosciutto cotto (two sunny side eggs over grilled asparagus and prosciutto, topped with thin slices of pecorino). You know, the type of meal where you find yourself closing your eyes, pausing, and letting loose a “Mmmmmmm” aloud. And often! We ate. We sipped the coffee. And we watched the other customers as they were seated, and talked about this magnificent city and our plans for the fantastic, hot, July day ahead. Oh my goodness it is Thanksgiving! The day when I am truly grateful that I will have more food than I need before the day is over. The discipline will need to kick in for sure this evening when, at 4:00pm, I meet Alexis and we share a delicious dinner at a restaurant here in Annapolis. Kick in, yes. Take over? Never! Will miss cookng the huge spread I prepared often when the children were younger, we all lived in the same house, and we shared food with neighbors and friends in our dining room. I cooked all day (and several days before) and was exhausted after the kitchen was cleaned. But I loved it. Absolutely. However, even without our family’s tradition, Thanksgiving is my fav holiday. It’s all about friends and family and food and thankfulness and love and peace without the shopping involved. Unless, of course, I’m in the grocery store trying to reach that last package of cream cheese in the back! So, here I am in the apartment, enjoying my quiet day at home. Trying not to eat much because I want to super really enjoy my meal later today with Alexis. So, how do I make the morning special? Well….. my second cup of coffee was awesome! 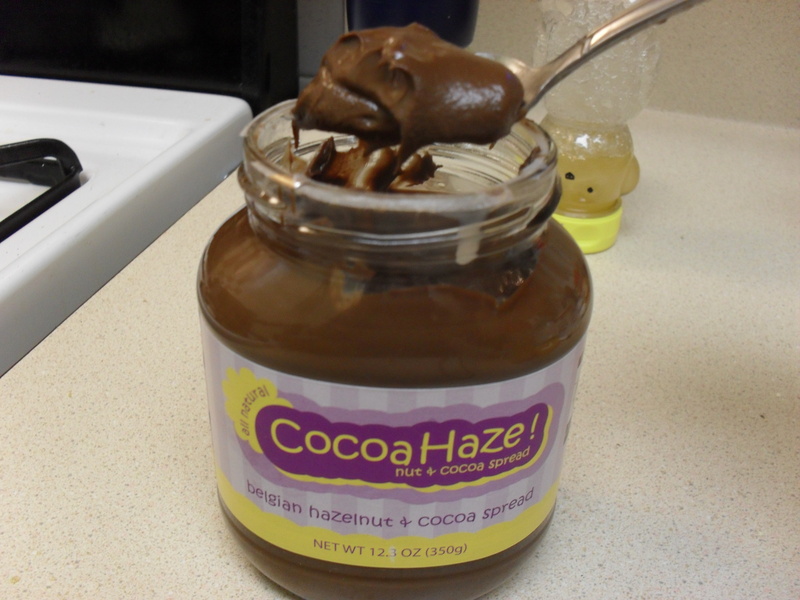 First, I took my cup and plopped in a heaping teaspoon of Cocoa Haze!, a hazelnut & chocolate spread I purchased last week at Whole Foods. Poured in my hot Starbucks coffee brewed a little earlier, and added a little heavy whipping cream and right much skim milk. “Why the skim milk?” you may ask. Well, so if anyone says to me, “Antoinette! You know that chocolate/hazelnut/caffeine/fatty cream mixture is not good for you.” I can reply with, “But I used skim milk!” Yes. This advanced education made me a genius. Life today is tough. OK. Not. Oh my goodness! Seriously, people. Delicious!! •	Heated up ½ cup of Starbucks coffee left from this morning (perked/brewed at home). •	Added a little non-sugar sweetener, two heaping tablespoons of Ghirardelli cocoa mix, and 1/2 piece of hard peppermint candy. •	Stirred until all was dissolved. •	Added more coffee (room temp by this time of day), and a little half & half. •	Completed with skim milk (I like a lot of milk). Ice. Straw. Stir again. Oh yum!! Today I leave the world of food to talk about my fascination of the world of business and how it all comes together when it works well. However, the food will surely be brought back on another day! Oh how I am captivated by the business world! Let me rephrase that: How I love the business world when I believe it is done correctly! The best way possible. With thoughts of long-term profits to keep it going. To continue the support of its employees, because this business would realize the value of good employees. This business would offer decent salaries to employees as it grows, as a way to not only reward them, but to attract the best, and to be able to eliminate the ones that are not worth the training or salaries or benefits that are offered. All people are worthy in the scheme of life, but not all are worth the extra $$$$ and time in a particular business. If an employee is constantly late, cannot fulfill the duties needed, or complains a lot about the work and the employer, then maybe he/she is in the wrong place and they need to go elsewhere. That person may do well and succeed in another setting. A totally different job. I’m going to talk about retail here, because retail is what I know best. I want to go into a store and know that the person at the counter or on the sales floor is glad to see me. They want to make my day even better. After all, I’m about to (maybe) give them my money in exchange for a product or service, and I want to know that this exchange is appreciated. I had to work for that money, too. Anyway, I went into a store yesterday to make a purchase, and, well, I can be rather perky. Sometimes annoyingly so to those around me. But in Kansas, it is normal. I do love that friendly aspect of Kansas! So I walked up to the young man behind the counter and said, “Good morning! How are you today?” And he replied, “I’m here I guess.” I wanted to say something back like, “Really? Is that how you feel about me today?” Always wanting to be the teacher, I reckon. But I did not, I just laughed and said something like, “Well I’m glad you are here because I need someone to – – – – ! And it’s all about me!” He laughed, a little, though he didn’t really see the humor. Neither did I honestly. Starbucks may be a global company. They are huge. But to me, they do it well. Some complain that they take away business from the small guy. Let’s first realize that there were very, very few coffee shops that offered the “third place” experience before Howard Schultz got excited and spread the word. Sorta like Christopher Columbus. Columbus may not have been the first explorer to set foot in “the new world”, but he was surely the first one to get so excited about it! He went back to Europe and marketed his enthusiasm, spreading the word of this wonderful new place and blah blah blah…..and here I am in the center of that “new world” this morning. [Yes, we can and should continue to talk about all the horrible tragedies that transpired involving the American Indian, but that is a conversation for another day.] The point is, Howard Schultz may not have been the exact first, but he surely ran forward and spread the glorious idea! When I lived in Chapel Hill, NC, starting my morning reading a book or newspaper over a cup of coffee was a favorite activity. In the beginning, most mornings I walked to a locally-owned coffee shop. Very artsy. Loved the decor! There was hardly ever anyone else there, and soon I realized why. The coffee was not bad, but there was not a smile in the place. No one to make me feel welcomed. The man behind the counter always made me feel that if I had not come in for coffee, he could still be in bed! Soon I was a regular at the Starbucks about a block away. In no time they knew my “regular”. They made me feel welcomed. Made me feel like they were very glad to see me. Almost as if we were all part of the same team. People were walking in all morning, lining up to take their coffees with them to work. Every once-in-a-while I would try the independent store again, because I do believe in supporting them, but couldn’t stay. Nope. For my money I also wanted to feel appreciated – not in the way! Once in 1998, and once in 2006, I seriously considered opening a bookstore and small coffee shop in my small town in Virginia. I planned strenuously and strategically. Studied my community (what worked in Richmond or Durham would not necessarily be the best for my own community). Found the perfect locations. Planned on salaries of valid employees. Offering students (also valid employees) before and after school the chance to earn a little money and learn about customer service and business and profits if they really wanted a job. Training for employees. Training for myself. Opening the hours most needed by my community. Marketing plans were of the utmost importance! I went to the U.S. Small Business Administration (SBA) for a blueprint of sorts to make my plans. (SO much is available online, now. Unbelievable!!) I had already taken a few accounting classes, so I knew some about financial planning and balance sheets. I read all I could about Howard Schultz, and his first book, Pour Your heart Into It: How Starbucks Built a Company One cup at a Time, was my favorite. I read more about coffees and brewing. And teas. Read about bookstores and the importance of a small business staying involved in the community. Ways to market and advertise. How to choose the best employees. Customer Service. Always customer service. In 1998 the SBA representative even told me after showing my plans to the group that was reviewing my work: I had the best business plan they had ever seen. Ever! Let me say here I was thrilled, but you must know it was not because I am so brilliant, it’s just because I followed their steps to a valid business plan step by step. And also had put lots of thought into the marketing plans for my community. I do know how to follow rules! However, both times it came down to money. Both times the SBA encouraged me to continue through with my plan, follow through with my paperwork, but I was scared. There was so much money to borrow, so much money to pay back, and I did not believe I could do it. One thing I did not understand in financing was how to get investors. There were a couple of people that simply came forward and said they wanted to invest – they knew me and wanted such a store in our community. It would have meant long hours for me, but after being a mom for many years, I was used to that! However, I just did not have the guts to take the risk. Period. The possibility of not being able to pay back people that believed in me? And the possibility of losing our house obviously would affect more people than myself. So I walked away from the opportunity. However, I am so fortunate that I love my job as a librarian and know that for right now I am in the best place for me. However, I still think of my own business plans when I see another business done well. Coffee, graduation, and yes! more food. A change of scenery for me today. Here I sit in the dark (coz it’s very early in the morning and my hubby is still sleeping. Since I don’t see him too much, I actually enjoy his little bit of snoring and I don’t want to interrupt him! So I have not turned on any lights in here). I’m sitting on the bed in our daughter’s apartment in North Carolina, enjoying some……oh you know it!…..delicious morning coffee. Yesterday was her graduation ceremony to celebrate her earning of an Associates in Applied Science in Motorsports Technology Management. She is continuing on with her studies to earn a second degree in Accounting, which I’m thinkin’ is a marvelous idea. She is certainly living in a time when life-long learning is an important part of surviving in our economy, and I’m glad she finds interest in so many different things. Not that even 10 degrees guarantees a successful monetary future! But it should open more doors for her and simply make her whole life more interesting for sure. First stop for me after she picked me up at the airport on Friday? Seafood restaurant, of course! Oh my goodness!! A plate full of crunchy, fried, hush puppies, clam strips, and scallops!! (Oh be still my heart! Really? oops! I guess too much fried fish could really do that, huh. my bad.) Wow was it scrumptious! The plate was piled high – literally (and I use that word in the literal sense). And I ate almost all of it. Truthfully, almost all of it. I’m not sure when I last ate that much at one sitting. Hannah had a plate of seafood herself, ate all she could, placed the rest in a to-go box, and I was still stuffing the face. (did I say smiling face?) That scenario is what made me finally stop. I could have finished it all right there! But it was embarrassing to be so gluttonous right there in public for all the world to see. That type of eating for the Southern lady is to be done only in private. Maybe it was that meal that made it hard for me to eat anything on the following day? Later that night the hubby made it down from Virginia. And the next morning I prepared a few sausage biscuits for our breakfast, with my famous only one-ounce each sausage patties. Now, these are small patties for small whopp-um biscuits (you know, the ones you whopp on the counter to open?). I could only eat one, and I made myself eat that one because the morning would be long (graduation ceremony) with no snacks. That little biscuit and teeny tiny piece of meat held me fine until about 2:00pm when we stopped at Olive Garden, and I ate on their delectable salad and breadsticks. I also had a few mushroom caps stuffed with a crab meat topping from Hannah’s trio appetizer (which she ordered instead of a regular entrée). I truly adore the Olive Garden salad. It’s the dressing. Honestly, there is nothing so unique about the vegetable composition of this salad – so easy to duplicate at home. But that yummy dressing? Oh how I smack my lips at the prospect! Really, I’m licking my lips right now. My…… that’s sad, isn’t it? Maybe not. Surely it is OK to feel that grateful for the variety of nutritious foods available from our earth. I would love to buy a bottle of that dressing and take it to Kansas with me (no Olive Garden in my K-State city), but there is that whole “liquids” thing when flying these days. Unless I check a bag, pay extra $$$ for that, and then wait in a long line to complete the process. Nope! I’ll just eat my usual scrumptious Good Seasons salad dressing at home and treat myself to the Olive Garden concoction when I visit our daughter in North Carolina. Well, thank you world! While I’ve been sitting here, talking to you, contemplating my day and my life (now aren’t you glad I didn’t get into that conversation? ), the sun has come up and I’ve just about finished my second cup of coffee. Hubby’s still snoring. Our daughter continues to sleep on her couch with her greyhound and two kitties, even though I’ve heard one kitty stirring around just a little. It will be warm and humid here again today. Well duh. It’s the last day of May and I’m in North Carolina. And I’m smiling. I have a family I love. Another day of food on the horizon – and the wonder and curiosity of “what will those morsels of goodness be?” (I surely would never speak or write a sentence ending in a preposition, but I do tend to think that way at times.) In a few days I’ll be back at K-State U working as a Government Documents Librarian (the best job in the world for me). I’ll continue my quest for delicious foods with my new Kansas friends. And, I guess I ought to add in a new regimen of daily sit-ups in there someplace. Dang. Hey people! Today I am enjoying not only drinking my coffee outside, I am also perking it outside! I’ve brought out my propane camping burner and my little pot, and soon I will have real outdoor coffee. Except this Kansas wind is quite a challenge this morning and is delaying the process a bit! It should be perking by now and it is not. I’ve got a large stone trying to block the wind, but Kansas wind is not normal wind. No siree! It can come at a blast from all four directions at one time. Sigh. . .I guess in my quest to save energy I am wasting it this morning. Maybe I won’t do this except on a very, very mild morning, which means. . .uh. . .never again. Oh well. . . . Ooooh, smell that? It’s the coffee perking. Oh there is nothing quite like the aroma of freshly perked coffee. I’ve got my breakfast of 1/2 slice of bread and natural peanut butter (none of that Crisco-y feeling peanut butter for me! ), some cubes of yummy cantaloupe, and 1/4 cup of yogurt with some Grape Nuts for crunch. Sad, I do use regular white bread out of a bag. I have gone through spells of eating whole wheat, but I just absolutely cannot stand it. I’ve tried different brands, and yuk. I don’t eat much bread so I’m not sure it is a real problem. Sure, it would be better to avoid white flour all together, but there are still a few things I eat that are not really good for me, and I guess this slice of white bread is one of them. I have tried to purchase rye bread, but all I can find in the stores here start with white flour, which means there is more white flour than whole grain rye. Such a trick these companies like to play on their customers! Well, I had to share my picnic with you. I think the coffee is ready so I’m going to sign off now so you don’t hear me making those awful “Mmmmmm” and Yummmmmmy” noises!